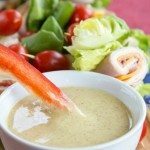 Whether you are putting together a vegetable platter for a party or packing some carrot sticks in your kids’ camp lunch, make them taste even better by stirring up a quick batch of light and easy Three-Ingredient Healthy Honey Mustard Dip. A couple of weekends ago, as we were heading out, my five year old asked where we were going. I said, “We are going to a festival. Do you like festivals?” Not to be left out of the conversation, the two year old piped up, “I like vegetables!”. Only he says it in the cutest way you have ever heard – “veg-tuh-booooools”. Seriously, we regularly entertain ourselves by repeatedly asking him to say “vegetables”. It’s adorable until you are on a three hour drive and the five year old spends a good portion of the time saying, “Say vegetables!” “Veg-tuh-booooools!” And then there is an eruption of giggles. Not gonna lie, it gets to be a little much. I’m just glad my boys are actually pretty good about eating their veg-tuh-booooools. The big guy will not eat tomatoes or zucchini, and the little one still can’t or won’t chew raw carrots and doesn’t like anything that’s been mashed or whipped. But other than that, they will eat most things. However, like all kids, they get in their moods, and don’t want to touch something that they may have just devoured a few days prior. So I have to resort providing something tasty for dipping. Everything from Homemade Ketchup to Greek Yogurt Pantry Ranch Dip, and yes, believe it or not, even Greek Yogurt Blue Cheese Dip are more likely to get my kids to eat the rainbow. And this is the newest one that they are loving. 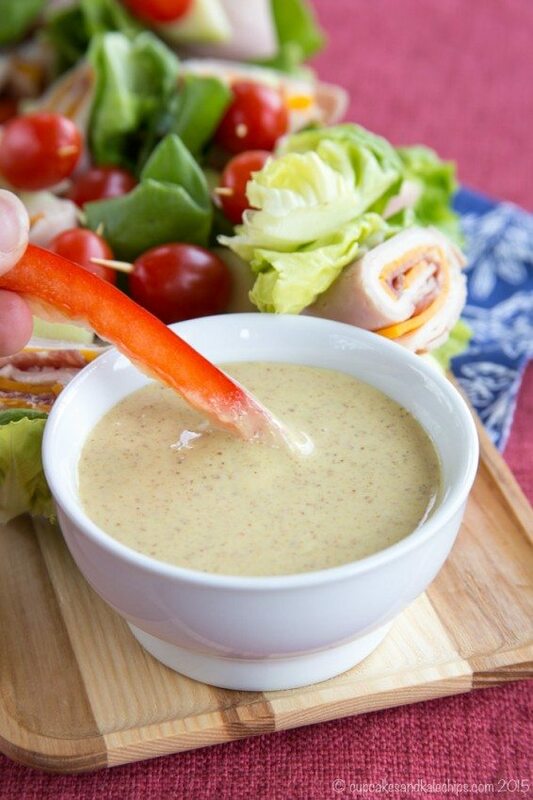 My boys have been licking their bowls clean of this Three-Ingredient Healthy Honey Mustard Dip. A little sweet, a little tangy, and I know that it’s made with real, wholesome ingredients, plus a little extra protein from Greek yogurt. I thought that Dijon would be a little to pungent and spicy for my boys, and yellow mustard a little too mellow, so I used brown spicy mustard. But go with what you like. Then mellow it out with some sweet honey, and just a bit of salt to taste and you have a dip that you can stir together in mere minutes with things you probably have on hand. I almost feel guilty calling it a recipe, but I know many of us, in a pinch, will grab a bottle of this or a jar of that. I mean, we’re all busy. So I just wanted to remind you of how quick and easy it is to make your own dips and dressings so that you can control the ingredients that are going into it, both for health and flavor. In fact, you can add a little apple cider vinegar and olive oil to thin out this dip, and you pretty much have my recipe for our favorite salad dressing that you can drizzle over your greens. 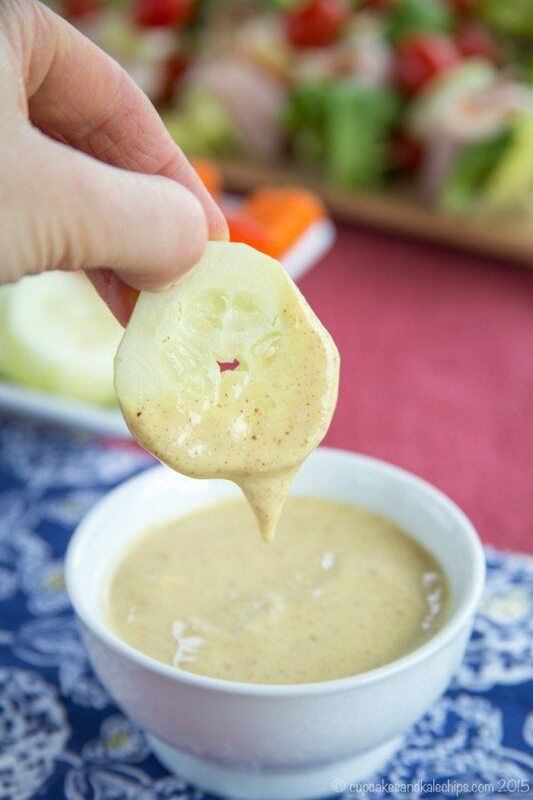 A quick and easy 3 ingredient healthy Honey Mustard Dip. Combine the mustard, Greek yogurt, and honey in a bowl and stir until combined. Season to taste with salt. Thank you for the nice and simple recipe.